Bored by regular wavy and curly hairstyles? We have a brand new idea for you! What about crimped hair? It has made a huge comeback lately and is extremely versatile. If you want to try it (and, actually, you should), read our guide to the best hair crimpers the market offers today. Find out why they are worth their price and how to style your hair using them. Crimped hair is wavy, zigzag-looking locks, equally popular among teenagers and adult women. It may be worn now not only to an ’80s-themed party but also to any casual or special event. We analyzed a lot of hair crimpers’ reviews and selected the tools with the best features and/or affordable prices. If you think that hair crimpers look the same as they did in the ’80s or ’90s, you’ve missed a lot. Today’s beauty tools are easy-to-use, fast-styling and, of course, much safer. And even more. Check the most important information about the best of these tools in our comparison chart, and then read the full descriptions and FAQs with expert answers below. A very popular tool for slightly softer waves than most crimpers create. This makes it unique on the market. The Wave Artist is designed with deeply curved plates, made of tourmaline-infused ceramic, which reduce frizz and add shine to locks. The Bed Head Wave Artist works with all types of hair. It has two temperature settings — low (for thin, fine locks) and high (for curly textures). Everything in between is good for normal healthy hair. The tool heats up to its maximum temperature in 2-3 minutes. With Bed Head Waver you will be able to create 2 different looks. If you want to get more defined retro-looking waves, make them continuous and don’t brush your hair after styling. For softer beach waves use a paddle boar bristle brush or twist sections before waving. Works on dry hair only! We marked the Bed Head Wave Artist as the best hair crimper. It gives locks texture, volume and body. The final result depends on your preferences: either natural-looking beachy waves or continuous retro waves. Great value for the price! One more top-rated tool from the Bed Head brand. It is reported by reviewers as the fastest hair crimper among those with 2-inch plates. The plates themselves have a chrome covering. It enables direct heating, quick styling and a super-smooth effect. However, it doesn’t slip down the hair, providing great grip. The tool has 3 temperature settings — low, medium and high. You will be able to adjust the temperature to your hair type. It has no shut-off function, there is only an on-off button on it. It heats up to 400° F, so at highest temperatures you need to use a good heat-protectant for hair. It results in well-defined small waves that may hold their volume for a week. Bed Head Totally Bent Crimper is intended for creating a classic ’80s crimped hair look. It works best on clean, dry medium-to-long hair. For shorter locks you may consider another tool of the same brand — a 1-inch Little Tease Hair Crimper, it can be used very close to the roots. The Gold N’ Hot crimper, according to reviews, gives hair high volume and dramatic texture. It has wide 2-inch plates with 5 waves at the bottom, which is enough for styling medium to long hair of any texture. The plates are ceramic, so the styler is gentle on all hair types; it makes hairstyles less frizzy, eliminates static and keeps hair well-hydrated, especially if a good heat-protectant is included in your hair care routine. The Gold N’ Hot gadget has a rheostat temperature control (a dial with small numbers inside it), a red light indicator and an on-off button. The lowest temperature is 250 degrees Fahrenheit, the highest is 450. 1-minute heat up time is also a bonus for those who are always in a hurry. The Gold N’ Hot crimper is a professional tool, but it is very easy to operate, so even beginners will manage the process with no effort. The Gold N’ Hot GH3013 model styles hair in small zigzag waves, making it feel and look thicker and the volume lasts until you wash your locks. It’s a good buy if you like quick styling appliances — it takes no more than 15 minutes to crimp long locks with a GH3013 model! This 3-barrel hair waver is, possibly, the strangest looking hot tool in our selection. Surprisingly, it can 1) crimp hair, 2) make it curly or 3) create deep waves. The result fully depends on the chosen method of styling and products. We are talking here about more defined waves, and Pretty Queen is a great example of how innovative beauty appliances may become really useful and a favorite among women of all ages. So, the Pretty Queen waver has 3 heating elements. Each of the three barrels is almost an inch in width, the length approximately 4 inches. See how large the waving area is? The tool works almost like the Bed Head waver (#1 in our article) but creates bigger waves. To make them more defined, hold the gadget on the strand for no less than 5 seconds for fine hair, and at least 8 seconds for dense locks. Shows best results on long hair. It should be used on completely dry and thoroughly combed locks. If your hair is very long and thick, consider pre-straightening before using a Pretty Queen waver. Abody’s tool is a stylish substitute for a curling iron, a waver, a straightener and a crimper. A perfect decision if you like ergonomic space-saving gadgets and are an incorrigible traveler! Abody’s tool is 4-in-1 as it has 4 different types of slide-out styling plates. They are taken off and replaced easily. The tourmaline-infused ceramic surface ensures even heat distribution without ‘hot spots’ that may fry hair and creates a smooth, shiny finish for locks. What’s about the design? Abody’s styler has a power button, 4 temperature settings – 160, 180, 200 and 220° С, and an LED temperature display. The tool heats up in 60-90 seconds and in general works super-quickly. Abody’s 4-in-1 Styler is a cool option for those who like to get more paying less. Not only does it include 3 curling types of plates, but it is a real savior for girls with thick manes. You may pre-straighten your hair and then crimp, easy! Another multipurpose tool with interchangeable plates but much simpler. It can smooth out and straighten locks, crimp hair and give it appealing texture or create deep waves and add volume. You choose! What advantages does the Conair styler have? It is very compact. The plates for larger curls have only 2.5 waves, for smaller and tighter 6 waves. The latter will be a significant helper in creating “partly crimped” looks. The styler, though, is very powerful, heats up to 400° F like any other professional styler and copes with thick hair of any length. It may not be a good choice for very fine hair as it doesn’t have an adjustable temperature control. Conair 3-in-1 styler will be a nice addition to your at-home beauty appliances if you are a minimalist and like everything simple. You just need to insert the chosen plates, plug the tool in, wait several minutes (blow drying or brushing hair) and start styling. Reviewers also say that this might be a great present for a teenage daughter or younger sister. This looks different from all the above-mentioned stylers, right? And it works differently. VOLOOM’s main aim is to create volume in the crown area of the head and at the midshaft. Crimped waves are almost invisible, but the effect they make is impossible to copy with any other tool! The main secret of VOLOOM’s hair iron lies in its creatively designed plates. They are made with small cubic raised platforms! You take a 1- or 2-inch hair section and “chew” it with the plates 2-3 times starting from the roots, then repeat this step for all under-layer hair strands. The result: styler crimps hair in small squares, lifts bottom hair layers and supports top locks. Your mane looks fuller and this miracle lasts for days. Ceramic coating and ion technology make this hot tool safe for all hair types (although this particular model is for longer, thicker manes). They defrizz hair and smooth hair cuticles, making strands shinier. Your hair will look the same as it normally does, just fuller. One more bonus: finally, it has an auto-shutoff function! The temperature is adjustable in five-degree increments (from 220 to 395° F). VOLOOM’s hair iron, featured in all top fashion magazines, is not a typical crimper. So if you are looking for classic tight zigzag waves, try something different (we suggest #2 and #3 from this article). But if you are in search of a hair volumizer and like to experiment with the latest beauty gadgets, go for it. Reviewers swear that the result will be beyond all expectations! If your hair is short to medium, you may consider a smaller sized VOLOOM Petite crimper. Now let’s answer the most frequently asked questions about crimpers (and we bet you want to know all this too)! What Materials Are Good Crimpers for Hair Made Of? ergonomic handle, anti-slip rubberized covering, finger-rest areas, etc. What Else Should I Take into Account When Choosing a Hair Crimper? design – whether it is lightweight enough or compact for traveling, think where you will use it and for what result. How Do I Use a Hair Crimper? Wash your hair, blow- or air-dry it. Turn on your crimping iron. Take a 2-inch section of hair, clamp the crimper close to the roots (or in any other way you decide), and hold for 2-8 seconds (read more about timing below). Release the plates, match the utmost wave with crimping plates. After processing all strands (or several isolated strands), brush them for more volume or just run your fingers through your crimped hair strands. Finish styling by using a hairspray. Can Crimped Waves Be Made Without a Crimper? Of course, yes! But you still need a tool if you want to get a 100% satisfactory result. We’ll explain why. All other methods, including overnight tight braids, styling with bobby pins or a curling iron will not give you such perfectly continuous symmetric waves. Being a perfectionist in this case is not bad. What Modern Hairstyles Can I Make with a Crimping Iron? Today’s hair fashion is extremely versatile. The simplest styles include fully and partly crimped loose locks. Crimp hair and create a simple updo out of it — a bun, a chignon, a tuck-in or a French braid. Tie a ponytail and crimp it with a small-sized tool. Or crimp the roots and then tie a pony for a bump in the front. Despite the chosen style, your hair will always look bigger and elevated. What Crimper Size Is Right for My Hair? The tiniest wavers on the market are 1/2-inch crimpers. They are mini-copies of regular size tools and in the majority of cases serve as a quick decision for touch-ups, cropped hair, and creating root volume. So, if your hair is short or you need to invent a new hairstyle in a minute, consider this size. For the thickest hair types brands invented 2- and 3-inch hair crimpers. They grab bigger hair strands and process them quicker. We advise you to always read manufacturer’s instructions as every crimper is made with a unique set of features and plates may be, for example, not so wide but longer or more powerful. What Temperature Mode Should I Choose for My Hair Texture? for thick, naturally curly or dense locks you may need 370-400° F.
And remember one more trick: the first time you use your new crimping tool, select a lower temperature than you think you might need. Experiment and find out what temperature works exactly for your hair. How Long Do You Have to Keep the Crimper in Your Hair? It depends on the natural texture and condition of your locks, on temperature setting and material of the plates. In the majority of cases ceramic crimpers may be kept in the hair for 2-5 seconds if your locks are fine. For thick hair strands you may need the whole 8 seconds. If you want to create almost invisible waves for volume, don’t hold the crimper for too long, 2 seconds are enough. Well-defined ‘sawtooth-looking’ waves are the desired result? Then hold the crimper iron clamped for longer. What Are the Main DON’Ts Regarding Hair Crimpers? don’t forget to use a heat-resistant glove if your crimper doesn’t have “cool tips”. 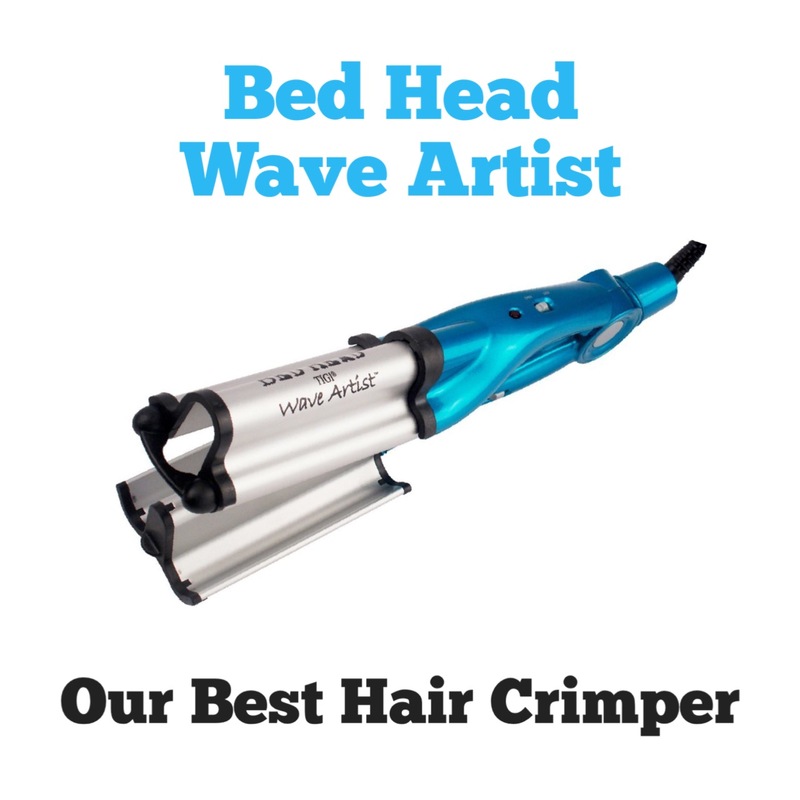 Our choice of the best hair crimpers is based on customer feedback and reviews. We’ve rounded up 7 really cool bestsellers that both work perfectly and look nice. Be sure to carefully read all the information given and make the right choice for your hair texture and length. We wish you a boost of imagination and perfect crimped waves as a result!